William Anthony Hall aka "Old School"
Member of the 45 Boyz MC was killed Friday, October 14, 2016 in Prichard, AL during an attempted robbery. On November 12, 2016 Anthony Johnson ( Big Shorty) president of Port City Notorious Ones MC was involved in a terrible motorcycle accident involving a vehicle. One street away from home Anthony T-boned the car of a young driver who approached the turn lane and tried to beat the caution light. The young man realized too late that Anthony was already coming thru the light. Anthony was taken to USA Medical Center with injuries that seemed to be non-life threatening until test were ran. It was then discovered that he needed immediate Heart surgery and Pelvic surgery. As the days went on more complications and the need for other surgeries were discovered as his health started to decline. Anthony was placed in a medically induced coma and life-flighted to UAB hospital in Birmingham, AL where he passed away. Willie "4 Corners 4 Dees"
Passed October 5, 2015 due to heart complications. He is a former member of Triple B MC. The brother of Shine (Buffalo Soliders). He is missed dearly. Let's ride for our fallen sisters and brothers bikers on August 15, 2015! MOBILE, Alabama - A beloved member of the community, known for walking away from a life crime to help others has passed away. It came as a heavy blow for family and co-workers of Kenneth Davis, who was a chaplain at Mobile Metro Jail. Davis worked at the jail for more than a decade, but before that served time in the facility for drug offenses. He turned his life around after finding religion. Administrators say his past played an important role in his ability to help inmates. “He had instant credibility because when he walked into a jail cell he knows what these people are experiencing he has walked the walk and talked the talk of a hardened criminal. He’s got instant credibility that a lot of our religious volunteers just don't have because they have never been in the shoes of these inmates,” said Warden Trey Oliver. Inmates say he was fixture at the jail chapel frequently holding services. “He can't be replaced, nope, it's impossible,” said Christopher Porter, who says Davis reached out to him after his father passed away. Davis was only 45-years-old. The official cause of death was congestive heart failure. A memorial service for the community is planned for Friday July 11 at Showers of Blessings Church of God In Christ in Mobile at 7 p.m.
Funeral services will be held Saturday July 12 at 10:30 a.m. At Nazaree Full Gospel Church. Tuesday, December 10 2013, 12:52 PM CST UPDATE 11AM: Local 15 News talked with an eyewitness to Tuesday morning's fatal crash. She said one of the vehicles was going the wrong way. "I'm in right lane. He's going left in the left hand lane, flies by me so fast I almost didn't realize it was real. Then the realization hit me, there's a car driving the wrong way down the interstate. He or she was speeding, a very high rate of speed. It's probably one of the scariest things I've ever been through," said Susan Crain. GRAND BAY, Alabama -- Three people died after two cars collided on Interstate 10 early Tuesday, sending traffic down an alternate route for several hours as police worked to clear the scene. The accident occurred around 4 a.m. in the eastbound lanes of the interstate, according to Alabama State Troopers. The cause of the collision between the 2004 Ford Explorer and 2010 Volvo S40 was still under investigation late Tuesday. None of the victims were positively identified due to a a fire that possibly ignited after the crash, Troopers said. The charred remains of a silver vehicle could be seen on the side of the road some 11 miles west of Mobile. Richard E. Sims, Jr., age 26, a native of Brewton, AL and a resident of Bay Minette, AL received his wings Tuesday, December 10, 2013. Ricky attended W.S. Neal High School in Brewton, AL and was currently employed with ISC Contractors at the Chevron Plant in Pascagoula, MS. He was a motorcycle technician for nine years and loved anything to do with motorcycles. He dreamed of being a professional road racer and one day owning his own business. Ricky never met a stranger and touched every person’s heart that had the pleasure of knowing him or crossing his path. He loved everyone, he always had a smile on his face and left you with a smile. He was selfless and loved and lived life to the fullest. He is survived by his loving wife, Ashley Stacks Sims of Bay Minette, AL; his mother, Gail Pettis of Bay Minette, AL; his father, Richard Sims, Sr. of Loxley, AL; his brothers, James (Harmony) Bodtke of Daphne, AL and Benjamin (Dawn) Bodtke of Minot, ND; his sister, Tabitha (Robert) Pittman of Loxley, AL; grandmothers, Catherine White of Flomaton, AL and Marion Boutwell of Pace, FL; nieces, Harleigh, Emma, Jamisyn, Serenity and Kaydence; nephews, Big Cameron, Little Cameron and Braden; his father and mother-in-law, Charles and Drusilla Stacks of Pine Grove and a host of aunts, uncles, cousins and special friends, Ryan “Stopher” Holmes, Vincent Pilck and Paul Martin. He was preceded in death by his grandfather, William J. Boutwell and his step father, George Pettis, Jr.
A visitation will be held Saturday, December 14, 2013 from 1:00 p.m. until 2:00 p.m. with a celebration of life service at 2:00 p.m. at Healing Waters Church in Bay Minette. In lieu of flowers, donations may be made to the Richard E. Sims, Jr. Memorial Benefit account at Wells Fargo. Joseph L. Berryhill, Jr., - Born Nov. 26, 1993 and departed this life all too soon on April 18, 2013, he traveled to glory to be with his Heavenly Father. He was a native and resident of Mobile, AL. Joseph was presently a senior at John L. Leflore High School. He accepted Christ at a very young age and united with Mt. Calvary Missionary Baptist Church under the leadership of Rev. Norvel Glover. Joseph was truly a loving, and kind hearted young man who was adored by many. His smile would melt your heart. He will certainly be missed and loved by his family and friends. He leaves to cherish his memories, mother, Alicia Davis (David E. III) Blackston Queen Diva of the Pacestters MC; father, Joseph L. (Rhonda Whistenhunt) Berryhill, Sr.; stepfather, Cedric L. (Linda) Stevens, Sr.; devoted grandparents, Frank (Annie) Moore, Elizabeth Berryhill; siblings, two devoted, Grayling A. Davis, Cedric L. Stevens, Jr., Adrian Thomas, Kendrick Stevens, Qykerita Sewell, Bernita Dubose, Tiffany Williams, Raven Bermoudy, Caleb and Jocorious Berryhill; dedicated uncles and aunts, Leroy (Angela) Davis, Prattville, AL., Dwayne (Layvettia) Davis, Mobile, AL., devoted cousins, Kresston and Kingston Davis, Prattville, AL., Darryn, Muriel, and Annalisa Davis, Riverton, Wyoming, Xavier Davis, Willie and Joseph Warren, Mobile, AL., Aneaka Davis, Tacoma, WA., and Shekena Grimes, CA. A host of other relatives and friends. Visitation will be held on Saturday, April 27, 2013 from 9 a.m. until the 11 a.m. funeral hour at Mt. Calvary Missionary Baptist Church, 505 N. Price Ave. Prichard, AL., Rev. Norvel Glover Pastor and Officiating Minister. Kickstands up at 10 am. Viewing of the body 9-11am, funeral at 11am. Burial Site Gethesemane Cemetery on Mobile St.
Repass at the church following burial. kickstands up at 10:00am to head toward the church. if you would like to be a Pall Bearer. WATSON III Melvin Elyard Watson III, a native and resident of Mobile, Alabama was the first born son to Brenda Watson Kennedy and Melvin Elyard Watson Jr. on August 4, 1981. Melvin departed this life on Saturday, April 14, 2012. He was preceded in death by his grandparents, Melvin E. Watson Sr., Hermiel Pinkney Watson and Joseph L. Dennis Sr. He received his early education in the Mobile County Public school system, graduating from W.P. Davison High School and was employed by the City of Mobile. Melvin was deeply loved by his family and friends. He will be sorely missed but his loving spirit will be with us forever. Melvin leaves to cherish his memories, his mother, Brenda Watson Kennedy, his father, Melvin Elyard Watson Jr., stepmother, Erica Watson; a loving son, Kenjana M. Holifield; two sisters, Nikia Dinkins and Tamekia Kennedy; one brother, Lanse Watson; maternal grandmother, Velma McGowen; two aunts, Wendy (James) Bryant, Hermieon (Kevin) Carter; three uncles, Lawrence (Velma) Fulton Jr., Rodney Watson Sr., Gregory (Cynthia) Dennis; three great aunts, Jenice Reese, Carolyn (Jonathan) Shamburger and Linda Trotter; three great uncles, Solleo (Patricia) Pinkney, Isaiah (Yvonne) Pinkney; Alvin (Shelia) Pinkney; two great, great uncles, Hubert Stokes and Brown (Oglethia) Pinkney; and a host of other relatives and friends. 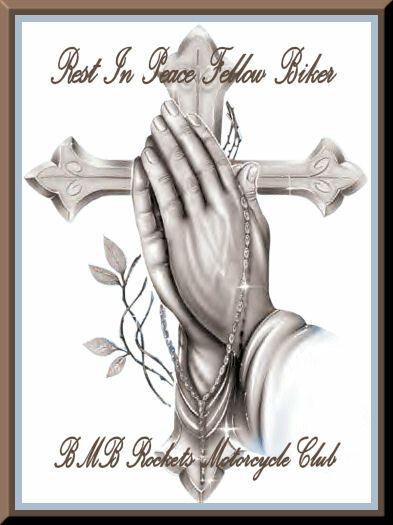 Funeral services held at Smith Memorial A.M.E. Church, 6501 Felhorn Rd., Mobile, AL 36608, Sat., April 21, 2012, 11am with visitation 9am until service hour. Interment in Gethsemane Cemetery. Arrangements by Johnson-Allen Mortuary. To all M/C and other we lost one of ours BROTHER on Monday . A member of N2DEEP ( 2SCOOP) pass a way . His funeral is this Saturday Oct.22 at 11am in Wilmer Al The Church is on hwy 98 at the second red ligth. We are meeting up at 10 am on moffet rd at the B.P. Next to the Winn Dixie at moffet rd and Hallsferry rd. Drivers often dodge them on the highway -- shredded tire fragments. A large piece of tire debris is being blamed for the death of a Mobile woman on I-10 Sunday night. It&apos;s being called a freak accident. It started as a day of fun and fellowship among bike enthusiasts. About 50 members of the Sixth Gear Motorcycle Club rode their bikes to New Orleans Sunday. Tajuana Williams, 37, belonged to the Mobile chapter. Williams and her boyfriend decided to head home to Alabama Sunday night. "We got a phone call that one of our members had went down ahead of us," said Robert Henderson. Henderson is the founder of Sixth Gear Motorcycle Club, headquartered in Moss Point. His group came across the accident scene on I-10 in Hancock County. They learned that a whole tire tread was lying on the interstate in Hancock County. The state Highway Patrol said a car hit the piece of rubber, tossing it into the air. The big chunk of tire hit the motorcycle, causing it to spin out of control. Both riders were thrown off the bike. "To lose a member that you love and care for, and you feel for her immediate family. It&apos;s a tragedy. It touched all of us deeply," said Henderson. "I can&apos;t believe this happened," said Shelia Jones, the group&apos;s secretary. Jones and other shocked friends remember Williams, known as "Miss T," as a bike lover and a good friend. "We clicked. She introduced me to most of everybody. And it was easy to talk to her and have fun," said Jones. "We&apos;re like a family here. We all get along. We all ride together once a month," said Henderson. Now, this family is trying to cope with their first fatality. "We&apos;ve had some people go down, myself for one," said Eric Nichols, a member of the club. "We go down, because this is what we do. But to lose somebody, never. Members said the accident could not have been avoided. However, the tragedy has made them think seriously about safety. "It&apos;s going to make us more aware of what&apos;s on the road," said Jones. "We make sure that we have a prayer first before we leave here," said Henderson. "We ride staggered, we do the limit, we take care of each other." And, they&apos;re planning to dedicate the next bike ride to Miss T.
"Oh, we&apos;re going to ride," said Nichols. "We&apos;re going to ride for her. She&apos;ll have a big ride." Williams&apos; boyfriend, Clarence Bradley of Mobile, suffered serious injuries. He was transported to Memorial Hospital in Gulfport. The State Highway Patrol says that same piece of tire debris caused heavy damage to three other vehicles Sunday night before it was removed. 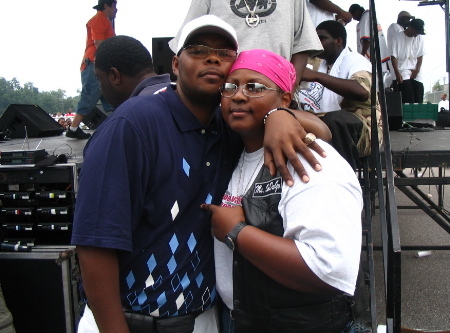 My good friend and biker brother Qwond Nesberry aka "Q" passed away 9-12-2010 of a massive heart attack. He was a member of the Big Bike Brothers aka "Triple B" Motorcycle Club. He was the club's vice president. He has been supporting me at my karaoke show regularly. I loved that guy. Michael Jerome Reid, a lifelong resident of Mobile, Al. was born January 10, 1963 and departed this life on July 15, 2010. He was a member of the Mobtown Riders Motorcycle Club. Michael is preceded in death by his grandmother Ms. Amelia Reid and brother Mr. Joe Nathan Reid. He leaves to cherish his memories, a devoted and loving wife Mrs. Carolyn Reid; one son, Mr. GerDaus Hill; and one daughter, Miss Kayla Reid; a loving mother, Ms. Marion Reid; two brothers, Maurice (Marion) Reid and Darryl (BiBi) Reid all of Mobile, Al; four sisters, Regina Reid of Atlanta, Ga.; Shirley Morris, Patricia Reid both of Mobile, Al, and Karen (Claudell) Mack of Saraland, Al. One grandson, (DJ); One devoted brother-in-law Christopher (Danielle) King of Atlanta, Ga. Four devoted friends, Keith Jordan, Christopher Davis, William (Heinz) Hollinger, and Kenneth Tate. A host of nieces, nephews, relatives, and friends. R I P "RAY RAY"